Renouncing probate is what you can do if you are named as executor in a deceased person’s will, and do not want to take on the role. You are not obliged to, but you need to take steps to put that into effect as soon as practical. Note, if you are looking for executor services, you can find a lawyer or law firm to do this by contacting the law society in your state/territory for referrals: links here. Alternatively the public trustee in your state/territory, links here, also provides executor services, as do some non-government providers including banks, even if they were not consulted when the will was made. There is no requirement that a named executor in a will must accept the role of executorship, even if you had agreed with the willmaker that you would. So in other words, can you resign as executor of an estate? Yes, providing you have not intermeddled in the estate already, see further below on what intermeddling means. If you don’t wish to act when the time comes, and you have not dealt with estate property, you can give up the right to do so. It means you give up your appointment as an executor, commonly called renouncing probate. In renouncing probate you are renouncing the executorship, in other words resigning. It means you renounce or give up your right to apply for probate of the deceased’s will; sometimes expressed as to ‘renounce probate’. Our nieces and nephews are the children of our brothers and sisters, this hardly needs saying. If someone wishes to leave a gift to their “nieces and nephews” in their will, it should be a simple matter, when the time comes, to identify which individuals are a niece or a nephew and so entitled to share in the inheritance. However circumstances and relationship may change from the time a will is made to the date of death. Probate – a grant of probate – what is probate? Probate is the official process to establish or prove, whether a deceased person’s will or testamentary document is valid and intended to be their last will. Court costs when contesting a will for family provision – who pays? Court costs in contesting a will may run into thousands. If you are thinking of making a claim for family provision under a will, despite all efforts to find a solution, including mediation, don’t assume that your costs will be paid out of the estate; at least in New South Wales. What happens depends on individual circumstances. Residue of a deceased estate, the residuary estate – what is it? What does the ‘residue’ or ‘to give the residue of my estate’ mean? The residue of a deceased person’s estate is what is left over after the payment of all expenses in connection with the estate. Expenses include payment of the funeral, costs incurred in the administration of the estate, payment of the deceased’s debts, the discharge of any liabilities of the deceased, and the distribution of any specific gifts made under their will. The residue or residuary estate is property of the deceased not disposed of by the terms of their will. Intestacy rules – who is entitled to inherit? Dying without a will (intestate) – who inherits? Intestacy is when you die without leaving a will. You are said to have died “intestate”. In the absence of instructions left in a valid will, who will inherit your property? Succession law contains strict rules to deal with this problem. 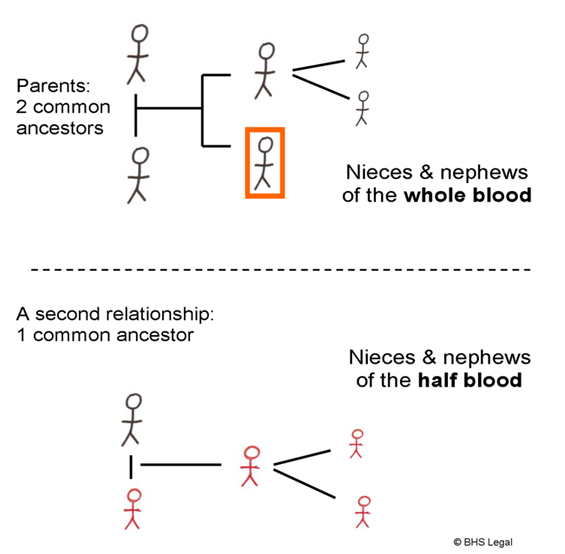 Why do a family tree? A family tree is a record of information about family relationships. It is useful to have a basic outline of close family/next of kin relationships to keep with your personal papers. This maybe unnecessary you might think. Disposing property by will, in the will-making process requires considerations to be given to what you own in your individual name, as opposed to what you might control, see further below. As only property owned in a personal or individual name can form a deceased estate, it is only this which can be transferred by will, (or the rules of intestacy).